A couple of weeks ago, with my greys at a serious stage and a few night's out planned, I thought I'd save myself some time and money and home dye my roots. Big mistake. I ended up with black roots....I don't know why as the colour I bought was medium brown but that's the thing with home colours, you have no idea how they will turn out. I have had reasonable success with another brand of all-over colour but had never used the root touch up before...and won't again! In any case, the hair gods were listening to me as a few days afterwards, I was asked if I'd like to try the colour service at Rogue Hair Belfast, which boasts not one but three of the very few L'Oreal Colour Specialists in Northern Ireland. This elite team of experts are qualified to degree level and guaranteed to be amongst the first to use the latest techniques and products...and to be able to fix any colour disaster that comes their way. You can read more about what a Colour ID artist actually is on this link. ...my hair is back to pre-home colour levels at this stage and I'd happily have worked with that but no - Karen was planning to work some magic in the colour department - giving it a bit more depth and tone and warming it up a little...as well as properly covering up the greys. 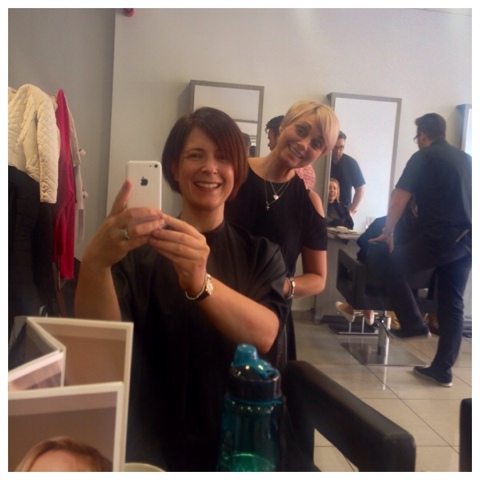 At this stage, I could really tell how passionate Karen is about colour and how much she knows about it - testament to all the extra training and time that goes into being a Colour ID specialist. On top of this, the salon is multi-award winning and holds the accolade of being the first Irish winners of the L'Oreal Professional Colour Trophy in 2009. With the colour sorted, the cut was next and as I was looking for a structured bob, Karen got her husband Jody to cut my hair - he's the short/structured hair expert and I knew I was in equally good hands here....though I think he wasn't expecting such a heavy mop of hair so early in the morning! 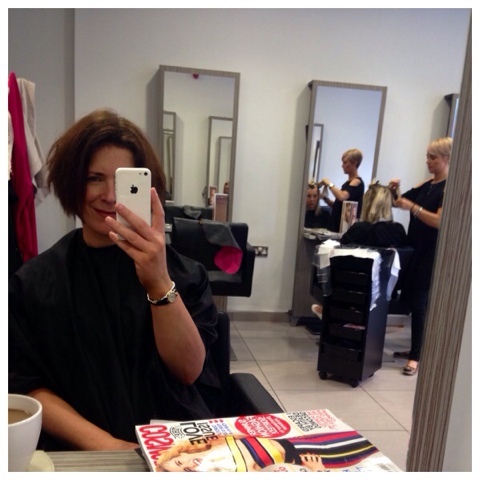 I am delighted with the greatly thinned out sharp bob he gave me - exactly what I'd asked for. For me, key in any hair salon - the banter was good. It felt relaxed and un-pretentious...the sort of place I could speak up and say no to what was being suggested or ask them to hurry up if I was running late. Very down to earth and very much up my street. Karen and Jody are a similar age to me, parents of 4 boys with one already in the grammar school my son will start in in September so it was great to hear about their experience as first time parents at that school. They really felt like good friends by the end of my session. I can honestly and happily recommend Rogue Hair Belfast as a great option if you have been looking (as I was) for a salon that's got gifted hairdressers who are experts at their craft but who are utterly down to earth and genuinely interested in earning your return business. Which they have. Since Uber closed last month, I've been a bit lost - but not any more! 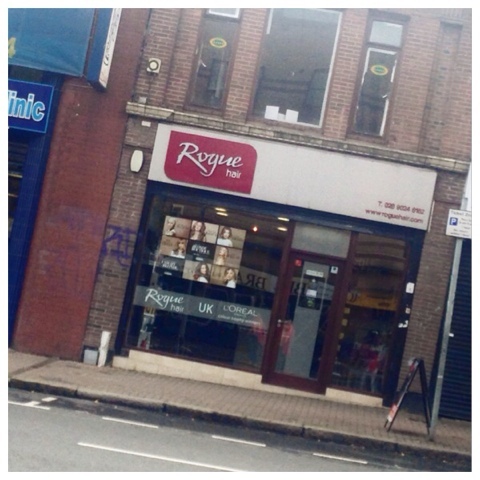 You can read more about Rogue Hair Belfast on their Facebook page on this link and there's a lovely article about Karen and Jody on the Belfast Telegraph website on this link. 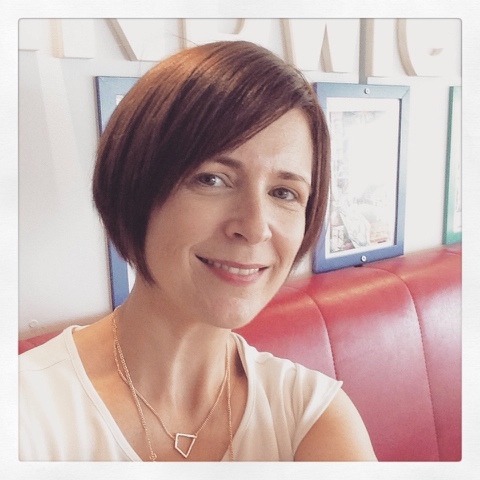 Disclosure - my cut and colour was complimentary but I was not obliged to blog about my experience nor was I paid to do so. All views are my own - but you knew that :) Thank you for supporting the brands that support me. I LOVE Rogue! My hair never looked better than when I had to come back from England every couple of months due to family illness. Haven't had the pleasure of Karen but Darren and Jody both amazing! 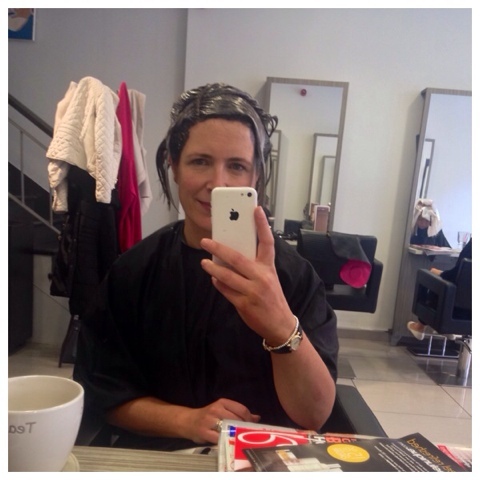 Thankfully not back so much these days but still make sure to book in for a cut and colour when I am. So pleased you loved them!